In the Settings application of iOS 5, Apple has added new options associated with the enhanced features of Safari. From there, in the "Privacy" section, users can flip a switch to enable "Private Browsing." As before, settings on cookies and the ability to clear a browsing history is also available. Also in the Settings application is a new option that allows users to choose how links are opened. In the "Open Links" option, users can select between "In New Page" and "In Background." From the Safari menu, users can choose the new "Add to Reading List" option, sandwiched between "Add Bookmark" and "Add to Home Screen." Once an article has been added to Reader, an icon shows up in the URL bar. Selecting the Reader icon then displays the text. 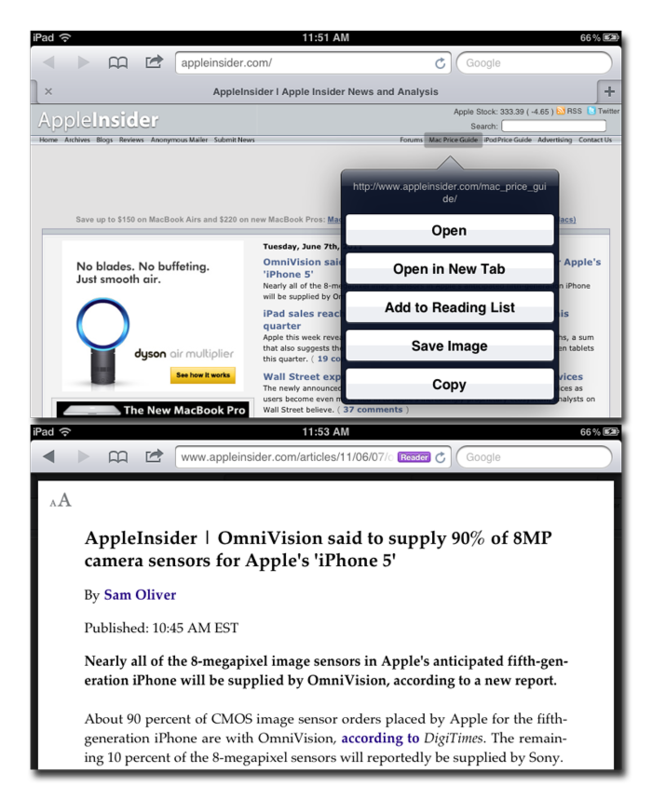 Content viewed in Safari Reader is stripped of extra images, formatting and advertisements. It is presented with black text on a white background, and the font size can be quickly increased or decreased. 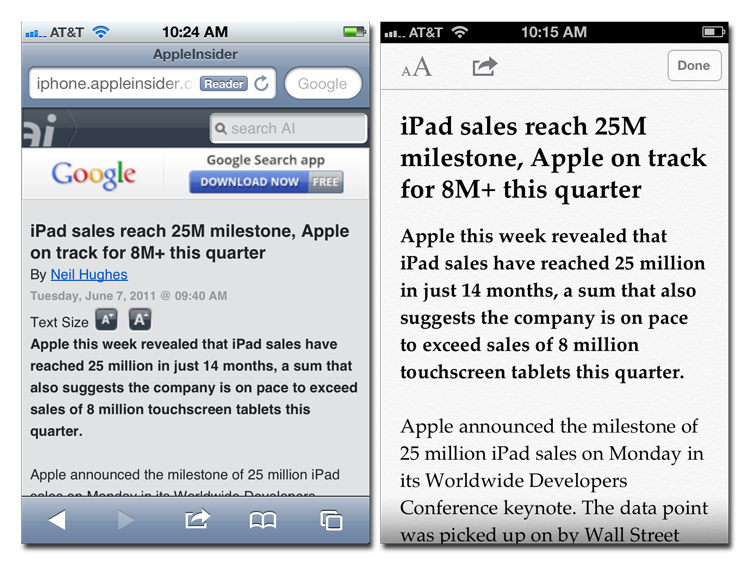 The appearance of text in Reader is similar to iBooks. Integration with Apple's new iCloud service will keep the list of content in Reader updated across all devices. The address bar in Safari also spots a new, subtle fade effect where a URL meets the stop or refresh button to its right. This replaces the ellipses that are used in iOS 4, and can create confusing by utilizing periods that are not a part of the URL. 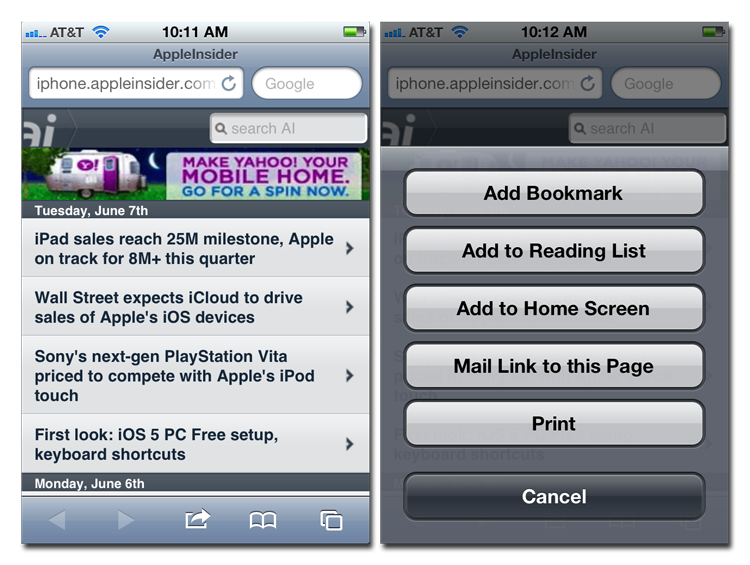 Holding down a link with one's fingertip pulls up the standard drop-down menu, with new options to open a link in a new tab or add the page to the Safari Reading List. 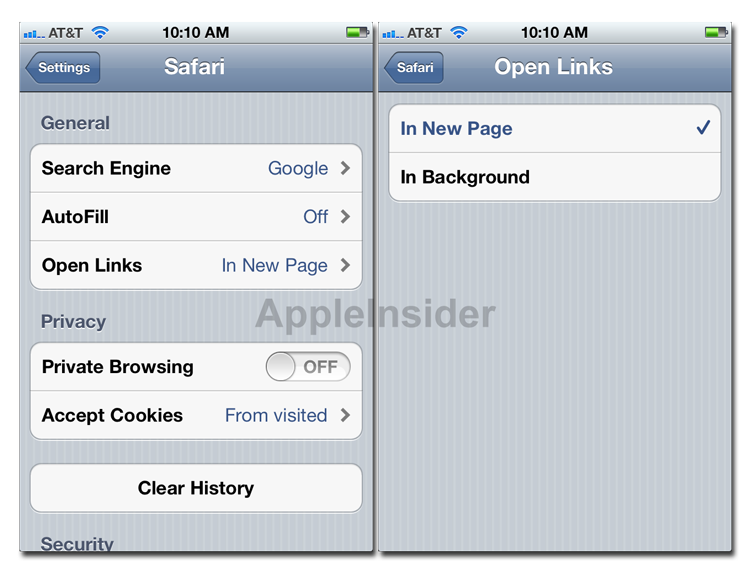 Those same options can also be selected for an open page on the Safari menu bar. The Reading List is available under the Bookmarks selection. From here, users can choose to view all items that have been added to the Reading List, or just unread stories. 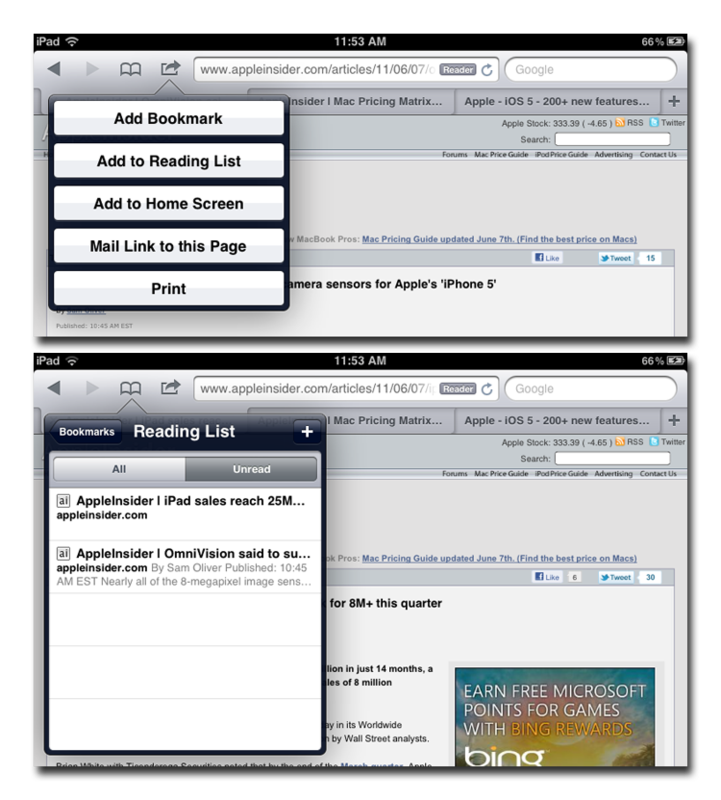 This menu can also be used to add or remove items from the Reading List. Tabs appear listed under the browser controls, URL bar and search box. When just one page is open, it is presented as one large tab with the page title, if "Always Show Bookmarks Bar" is turned on. As new tabs are opened, they are placed to the right. Active tabs can be closed by tapping an 'X' on the left side of the tab.